We are conveniently located on US Highway 19, just a little South of Countryside/Westfield Mall. ﻿As an Enrolled Agent, we have been tested and proven to be experts in all areas of federal taxatio﻿n. "let a professional do your taxes"
Who is doing your taxes ? 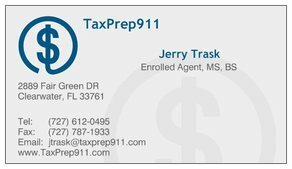 An Enrolled Agent is one who has demonstrated techincal expertise and professional ethics to the United States Treasury Department and has been granted enrollment to practice before the IRS, in all 50 states. Yes, we do accounting and payroll for small businesses, churches, and other organizations. And, YES we are accepting new clients. ​Call us today at 727-535-0450. Enrolled agents (EAs) are America's Tax Experts. EAs are the only federally licensed tax practitioners who specialize in taxation and also have unlimited rights to represent taxpayers before the IRS in all fifty states.